New Listing2 Royal Doulton Wellesley Cut Crystal Water Wine Glasses..They Are 7 5/8 Tall. Beautiful w i n e / w a t e r glasses. We ll t ak en c ar e.no Scratcheso r Blemishes. Heavy Glass CRYSTAL LIQUOR Decanter by Toscany Made in YUGOSLAVIA, VERY NICE. TOSCANY 24% LEAD CRYSTAL MADE IN YUGOSLAVIA GLASS DECANTER, WEIGHS JUST UNDER 5 LBS.VERY NICE CONDITION. Studio Nova Crystal Salad Bowl. 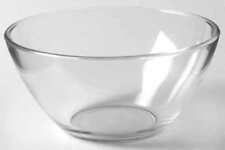 This bowl is in great condition, clear and intact. x 2-1/4" high. Excellent condition. I provide detailed pictures and try to point out any flaws or defects. No P.O. Boxes. 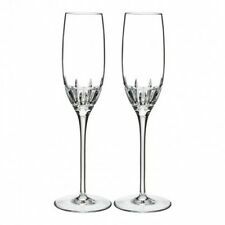 They have a gorgeous etched floral pattern and stems . It Looks like they were never used. Left corner. The glasses were never used. Very beautiful lighthouse motif, but the box does not look new. I've collected enough. 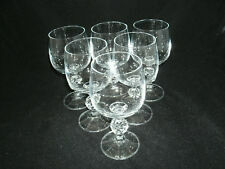 New Listing4 Gorham Cherrywood Nachtmann Nierstein Crystal Champagne Sherbet Glasses Mint! Great set of four (4) champagne or sherbet glasses in the Cherrywood pattern. These were made by Nachtmann for Gorham. Each one still retains their original label. They do not appear to have been used. Made in Ireland. I try to describe each item to the best of my ability. 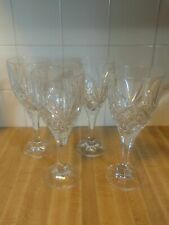 4 Shannon crystal water goblets Palm South Beach with Labels MINT! 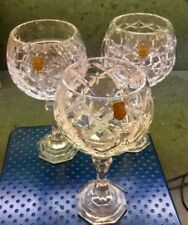 4 Shannon crystal water goblets Palm South Beach with Labels MINT!. Condition is Used. Shipped with FedEx Ground or FedEx Home Delivery. Beautiful mint condition free from cracks, chips , damage with all original Shannon crystal labels affixed. Heavy weighing over 1 lb each! This is a Rosenthal Turnus Studio Line Germany Square Box with Lid, 5¼" Tall. 3" wide. It is in excellent condition with no chips, cracks or scratches. See pictures. Clear Crystal Beveled Concentric Ringed Wine Goblets Glasses 8 oz. 8" High Set of 4. They have a bulb stem and deeply cut beveled concentric rings. Excellent condition! ROGASKA RICHMOND SCALLOPED CLEAR CRYSTAL BOWL 8 2/4” Diameter 3 1/2 TALL- SIGNED. Shipped with USPS Priority Mail. Hershey Kiss Covered Candy Dish Lead Crystal Ireland By Godinger. W Box. New ! Hershey's KISSES Lead Crystal Covered Candy Dish, Shannon Crystal by Godinger. Box (included) has copyright date 2011. Comes with box and brochure regarding care. Probably came from actual Hershey's Chocolate World in Hershey, which is very near where we live. Pictures are of the actual item that you are bidding on. Taken carefully out box for pictures and then put back. Will pack with plenty of care. From Smoke Free, Pet Free household. Item is brand new; no cracks or chips. Never been used. Sat on shelf in box, forgotten that we had it. Sold as is. Thank you for bidding. 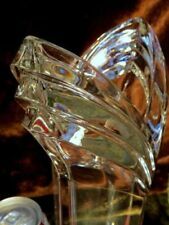 5 out of 5 stars - Hershey Kiss Covered Candy Dish Lead Crystal Ireland By Godinger. W Box. New ! 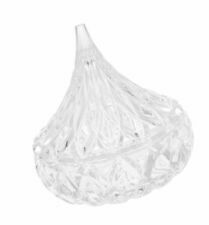 9 product ratings9 product ratings - Hershey Kiss Covered Candy Dish Lead Crystal Ireland By Godinger. W Box. New ! This is a lot of five 8 oz crystal goblets. They have an air bubble stem. I am unsure who the maker is. They are all in excellent condition. Crystal basket. Each end opening has smoothed scalloped rims and features slight curves that lead to a decorative tiara like point at top of handle and top edge of bowl. Highly polished to accentuate the brilliant clarity of the fine crystal, provide maximum light diffraction and present a beautiful presentation. Crystal Wine Glasses. wine glasses adorned with lovely. Austria Pattern, 24% lead crystal with. Austria Pattern. These glasses have a very long and strong ring. This is a beautiful set of contemporary crystal. Lead Crystal Decanter. Classic Style Decanter to Begin a Collection. This gorgeous decanter was only recently removed from its original Neiman Marcus gift box, where it had safely lived within tissue. From the Amore Collection. I am a dedicated picker! Lead Crystal ~ Made in Germany. Vintage Perry Coyle Etched Glass Iris Pattern Champagne Flute glass Signed 12"
BEAUTIFUL piece of etched glass by artist Perry Coyle. This is a 12" tall champagne flute/glass, in his signature "Iris" pattern. Each original work of art by Mr. Coyle is unique and signed! PERFECT for your collection! These belonged to my Great Aunt who passed away in the 1980's. Sadly, I have no idea how old they are beyond that. Excellent Condition Hofbauer Byrdes bowl with lid. It stands 9" tall and bowl is 7 1/4" round. Beautiful candle holders condition is basically new I bought them and stored them in my china cabinet been there since..capture the light perfectly made my dining room into a rainbow light show on walls when the curtains were tied back..would make a beautiful addition to any dinner table..Bid away priced a fraction of msrp.. Crystal Bud Vase - Block Pattern. Shipped with USPS Priority Mail. 6 1/2" H x 2 1/4" W. No chips or cracks. Set of 2 signed Galway water goblets/beverage or cocktail glasses. I believe this is the Kylemore pattern. 7" tall and in perfect condition. New ListingLead Crystal Pedestal candy dish. Frosted tulip design. Set Of 4 Cera Clear Highball Glasses With 4 Dents In Side. I have a fifth glass and can add it to the box for an additional fee. These are 6” tall. Vintage Galway Irish Crystal Compote 5.5” Signed. This piece of glass is in excellent condition! 2 Royal Doulton Wellesley Cut Crystal Water Wine Glasses..They Are 7 5/8 Tall.